Bill Snyder took this photo on Oct. 13, 2012 from Heavens Mirror Observatory in California’s Sierra Nevada Mountains. Snyder used a Planewave 17” telescope equipped with an Apogee U16 camera, as well as a Paramount ME mount and Astrodon LRGB filters to view SH2-106. The total exposure time to capture this image was more than nine hours. Shaped like an hourglass roughly 2,000 light years from Earth, nebula Sh2-106 shines in this stunning photo. Veteran astrophotographer Bill Snyder captured this image on Oct. 13, 2012 from Heavens Mirror Observatory in California's Sierra Nevada Mountains. 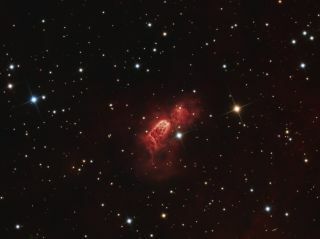 He used a Planewave 17” telescope equipped with an Apogee U16 camera, as well as a Paramount ME mount and Astrodon LRGB filters to view the SH2-106 nebula. The total exposure time to capture this image was more than nine hours. The Hourglass Nebula lies in the constellation Cygnus, the Swan. This compact star-forming region gets its signature shape from high-speed winds ejecting from the S106 IR star in the center. Editor's note: If you snap an amazing photo of the moon, or any other night sky object, that you'd like to share for a possible story or image gallery, send photos, comments and your name and location to managing editor Tariq Malik at spacephotos@space.com.